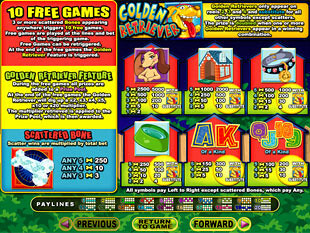 Go money hunting with Golden Retriever slot machine. Thanks to this game produced by Real Time Gaming you will get to know that there are special gun dogs which can smell the slots coins a great way off from them. Eager to get yourself such a unique dog? Then start playing the game right now and choose your favourite. Create all the necessary conditions for a precious dog and… You are a millionaire! 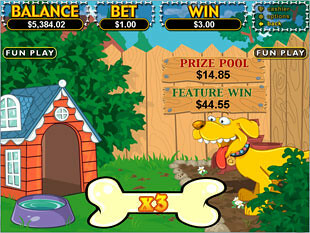 Lure Golden Retrievers with tempting bones playing the slots with 5 reels along with 20 paylines. Make an effort to take the advantage of them using a no download version. It is available for you any time. Just click an instant play and gamble online. Do just ONE lucky spin and be showered with a huge amount of money the progressive jackpot offers you. You can get this award randomly. So, keep an eye on the special place above the reels to get abreast of jackpot changes. Try to hit as many Golden Retriever images as possible as they are Wild symbols of the slots. You can find Golden Retrievers just on the 2nd, 3rd or 4th reels. Wild symbols can replace any game symbols except Scatters. Got your way and obtained the winning combination with Golden Retriever? Yippee! Your money prize is doubled. What attracts most common dogs? Bones, of course! But we’ve got special retrievers and it means… They need something special to be enticed. So, the slot machine owns exclusive Diamond Bones that are Scatter symbols. Are you patient enough to get 5 Diamond Bones at one go? Then catch the incredible prize from the game. It is a 250x multiplier allowing you to win $25,000 if you play with the highest bet of $100 herewith. Can see 3 or more Diamond Bones scattered at the reels? Feel happy to trigger 10 Free Spins. Want to buy the most delicious dainties for the pets? Then learn how to spend your money sensibly while playing the slots. Choose the coin sizes which you can afford. You may have $0.01, $0.02, $0.05, $0.10, $0.25, $0.50, $1 and $5 coins at your service. 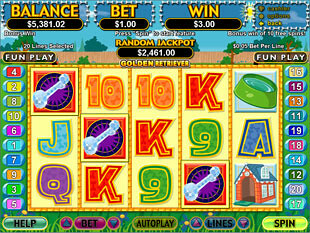 Putting 1 coin per line, you are free to play with 20 paylines as the maximum. Fix the possible bet amount as well. Make your choice in the favour of the minimum stake of $0.20 or more. But don’t exceed the highest bet of $100. Tame 4 Female Dogs and 1 Golden Retriever, and in this case the slots will give you the right to gain the top experienced jackpot of 5,000 coins or $25,000. Do you know a secret method how to make your game easier and hit the winning combos more and more often? We can give you a hint. It is a marvellous Stop Feature offering you to bring the reels to stop any time you like. If you want to get extra slots gifts, you need to hit at least 3 Scatter symbols. They will award you with 10 Free Spins activating Golden Retriever Feature at the end. Use a chance to content yourself to the maximum retriggering Free Spins. When your Free Spins stop running, Golden Retriever Feature is activated. There all your winnings from Free Spins are counted and added to a Prize Pool. Then a well-liked Golden Retriever appears and starts digging up an exclusive multiplier. Just for you. Thus, you can increase your wins by 2, 3, 4, 5, 10 or 20 times. Do you like dogs? What about golden retrievers? Imagine that you’ve got such an amazing pet at home. And it brings you slippers, licks your face waking you up, barks asking you to play with it… Agree that it’s so nice. And what if this cute animal will get money prizes for its owner? $25,000 or even more. Sounds tempting? 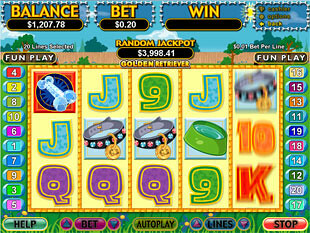 Then start playing Golden Retriever slot machine today and enjoy its great riches.